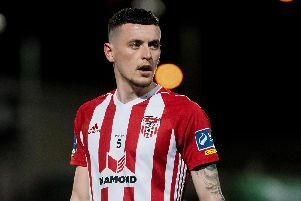 DERRY CITY midfielder, Conor McCormack is excited about being involved in his first North West derby match against Finn Harps on March 4th and revealed the club’s main objective is to secure European qualification this season. Commenting at the FAI and SSE Airtricity League official photoshoot on Wednesday, the Co. Louth man warned that the ‘Candy Stripes’ must be mentally prepared for a ‘physical’ battle against their Co. Donegal neighbours on the opening day of the new season. Derry City opened its pre-season campaign with the annual Billy Kee Memorial Cup fixture against Institute this week and came out on top on penalties after a tough challenge from the Drumahoe men. McCormack, who played 72 minutes of that clash before being replaced by Conor Gormley, was delighted to get back playing matches and believes Derry’s pre-season campaign will stand them in good stead for the North West derby next month. “It was good to get a game against Institute, it was a good physical game so that will get us nicely prepared for our first game,” said the 25 year-old. It’s going to be a good physical battle against Finn Harps up there. I haven’t played a derby for Derry against Finn Harps before so I know I’ll have to get myself ready and the whole team will have to be mentally ready to go into it. The former St Patrick’s Athletic midfielder, who joined Derry midway through last season and played nine games, is looking forward to getting a full campaign under his belt at Brandywell and has singled out matches against his former club Shamrock Rovers (April 8th) and St Pat’s (May 6th) and his hometown club, Dundalk on April 1st as key dates. “It’s going really well. Kenny (Shiels) has us in from January 10th and we’ve been working really hard. “The local lads were in three times a week during the off-season at the gym with Pearse Lafferty as well and I tried to make it up a couple of times myself so we’ve been working really hard. “I’m looking forward to playing against the teams I’ve played with before and obviously my hometown club down in Dundalk so I’ll be looking forward to those games again,” he smiled. “Hopefully we can push into Europe this season - that’s the main objective and hopefully we can get a good cup run.